Canadian Swan debuts with a wonderful collection of 13 stories and a novella. “It began to seem, after a time, that everyone had something. One thing they’d seen or heard that they couldn’t shake off, that they carried, would carry forever, like a hard, dull stone in the heart.” The quote refers to Swan’s odd gathering of recollections and remembrances—each titled, like a story collection within a story collection—making up the life story of twin girls who seem bent on self-destruction. World War II is included, through letters and testimonials, as the girls, by now women, take part in the war effort only to wind up, at war’s end, committing the desperate act foretold in the beginning. The title piece, a 2001 O. Henry winner, is really a novella—like, say, Tobias Wolff’s “The Barracks Thief”—at least to the extent that it’s a perfect expression of the form. 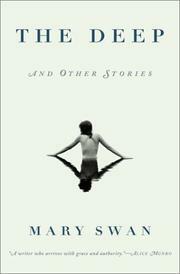 Other “stories,” though, include “Max—1970,” about a young man whose suburban stupor is exacerbated by his father’s trying to teach him how to fix an unbroken washing machine; “In the Story That Won’t Be Written,” about a divorced woman, lamenting the growth of her daughter and her ex’s new life, who tries to find an analogy for her own life in an old photograph that doesn’t offer up a meaningful narrative; and “The Manual of Remote Sensing,” giving a litany of men who come in an out of a woman’s orbit, leaving her with a kind of clairvoyance (“Watching him leave she knew with a sick certainty that he wouldn’t come back, that he would leave her there, lingering over a cold cup of coffee . . . . ”). The characters here often immerse themselves in the past, so it’s no surprise that suicide by water is a recurrent theme. Swan achieves the best possible of historical tones, neither nostalgic nor sentimental, but simply matter of fact, making her tales of the past ultimately timeless.